Your child’s smiles are precious expressions of joy and love, a simple yet bright reminder that they are happy and healthy. Keeping your little one’s pearly whites strong and shining now helps set the foundation for a lifetime of excellent oral health. At his family-friendly dental practice in Westfield, NJ, Dr. David M. Weinman specializes in making his youngest patients feel welcome and comfortable as he provides fundamental general and family dentistry services to smiles of all ages. When it comes to healthy teeth and gums, you know that brushing and flossing regularly help to keep painful, destructive cavities away. Did you know, though, that there’s more to maintaining your child’s smile than these essential at-home oral hygiene routines? Beginning at around the age of two to three years old, your child should see us for his or her first dental visit. Our caring, compassionate staff will ensure that this is a pleasant experience for all involved, setting the tone for years of happy dental appointments in the future. Dr. Weinman will assess your child’s entire mouth, paying close attention to how the teeth and jaws are developing. We’ll check each and every tooth for the tiniest signs of decay and inspect gingival tissue for early indicators of gum disease. As we always say, prevention is the best cure, particularly in the case of gum disease and cavities. To keep teeth strong and cavity-free, we may suggest fortifying fluoride treatments and protective dental sealants. If Dr. Weinman and his team do happen to come across any problems during your child’s exam, we’ll talk with you about a personalized treatment plan to address the issue. 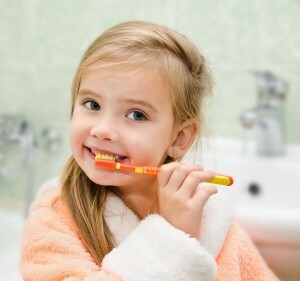 You’ll always be informed of everything we find as well as provided with information on the best ways to treat your child’s oral health concerns. At the office of Dr. Weinman in Westfield, NJ, we believe that every child deserves to enjoy a healthy, beautiful smile. Contact our office today to speak with our highly skilled, caring team and find out what a difference our commitment to quality can make for your little ones. We also happily welcome families from surrounding neighborhoods in the nearby areas of Fanwood, Scotch Plains, Cranford, Mountainside, and beyond.